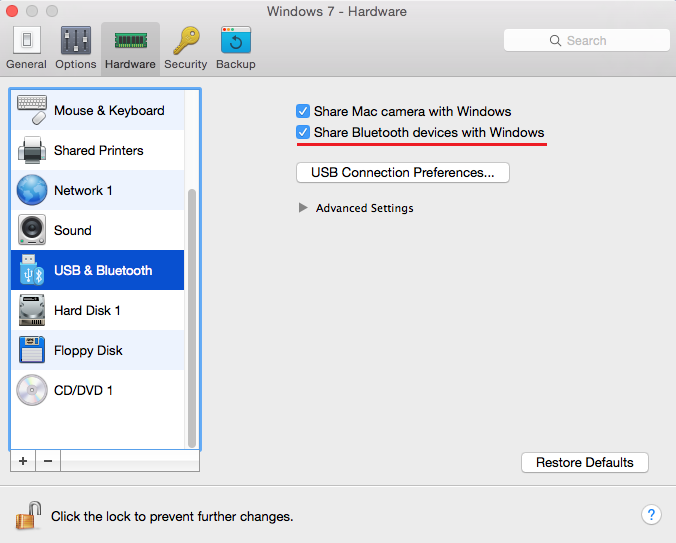 How to use Mac Bluetooth in virtual machine? I would like to connect my Bluetooth device straight to the virtual machine. How can I do that? The functionality has been implemented since Parallels Desktop 8 to share the Host (Mac) Bluetooth connection with virtual machine. IMPORTANT: On Parallels Desktop 12 due to stability reasons it is not recommended to assign Apple Bluetooth USB Host Controller manually to the virtual machine, please use Share Bluetooth devices with Windows feature as mentioned above. NOTE: The remotely connected Bluetooth device doesn't recognise virtual machine as a separate device, it recognises only Mac. You can initiate files sending/syncing only at the virtual machine side. Files, sent from the device will be received by the Mac. ActiveSync profile is not supported (Used in Windows Mobile devices).